I have been cooking for a while, 23 years to be exact and if there was one thing I've always been scared of, that is a pressure cooker. My mom married before she knew how to cook, so you can imagine the amount of experiments my family went through. At that time my parents lived in my grandparents' house and my mother's first cooking lessons came from her mother-in-law, which was not with the best intentions at the time. It is beyond me how you can put a pressure cooker in the hands of someone who ( forgive me Mom, you are the best cook now) never boiled an egg before, without a simple instruction how cooking is done with this pot. So, it figures, my mom blew up the thing, covering the whole kitchen ( ceiling included) with chicken noodle soup. Thank God nobody got hurt, but some say, you can still find traces of noodles in that kitchen. Of course my mom never wanted to see a pressure cooker in her life again, and she devoted herself in condemning this "wretched pot" as she used to call it. She told me the story time and again, adding some reassuring details from time to time, like who got burned/killed by a pressure cooker. She would never, ever want to hear about a pressure cooker being used and at that point I was resolved that this is the most scariest thing in a kitchen and I should avoid it at all cost. However, in the last couple of years I discovered that these "wretched things" pressure cookers are not extinct, even more people continue to use them very successfully. Cabbage ready in 3 min? You all know I love to cook, but I love more better having time. So if I can find something, anything to cook faster, I'm all for it. "If the pressure cookers are so dangerous, how come people still use them? ", I asked myself and as a very good child I continued the tradition to doubt my mother's words and to explore for myself the dangers of using a pressure cooker. So, I got myself a nice Presto 6Qt Aluminum Pressure cooker. Since I never used one before and I've never tasted food from one or even seen how one is used, I thought that it would be a good idea to write a review telling all the pressure cooker virgins out there what happened when I used it for the first time. The box is here, I open it and here it is, my first pressure cooker, shines with promise of less time spend in the kitchen. - It looked very sturdy, very durable kind of pot. Nice material, I would say it looked more expensive than the money it costs. - One unpleasant surprise was that I would have to put together the pot. I am not screwdriver shy in any case, but attaching stuff to something that might blow me up intimidated me and I spent good 2 weeks waiting my better half to have the honor of attaching the handles etc. - After my husband put it together we found out that he assembled the handles backwards ( it almost looks identical on both sides so it was easy mistake to make) and we couldn't close it. He switched the sides and then it closed very easy. So easy in fact, that I can close and open it with one hand. Of course I don't recommend doing that with hot things inside. - The manufacturing lubricant was rather difficult to remove. I used regular dishwashing detergent and warm water, but it still took me about 15 min to clean it up. 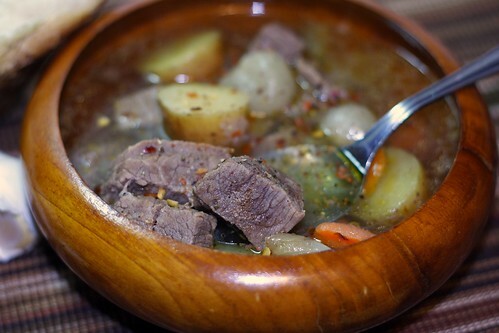 I choose the " Beef and red skin potato soup" recipe ( the link leads to the recipe), which is one of the most time consuming soups I make, because of the beef. I wanted to give the pressure cooker a really good test drive. Once the pot was on the stove, I felt a rush of confidence and decided there is nothing to it. I added the ingredients as I always do for my soup, added the the water and closed the lid. At this point I started to feel kind of nervous. All the stories my mom told me began to unfold apocalyptic images in front of my eyes but I got a grip and about 7 min after I put it on the stove, the pressure regulator on top started rocking and the real cooking began. I used to make that soup for good 70-80 minutes. The pressure cooker made it for 15 minutes after the pressure regulator started rocking. So this makes what, 7+15 min=22 minutes total cooking time. I can live with that ;-), for the extra hour I gained I could even go to a spa that day. Now we can talk about a lot of things and this pressure cooker can have many advantages including faster cooking, but if the food tastes like ....well, you get it, the other relatively means nothing. So, let's talk about the taste. - this was one of the most flavorful soups I ever tasted and I used nothing more than salt and pepper. - The discoloration of the vegetables was minimal! Something I always wanted to achieve with a regular pot. - The texture of the meat was more delicate than the one I cooked in the regular pot, without making it mushy. - It's not dishwasher safe. Unfortunately for that price if you want to get a good pressure cooker you have to get aluminum, and you can't wash aluminum in the dishwasher. However, since you are not supposed to store the food in aluminum too, it cleans very easy with water and warm soap right after cooking. I hate washing dishes by hand, but this really takes a minute. Are the pressure cookers dangerous to use after all? What I have to say is this- in the "right hands", a fork is dangerous. 1. Read the instruction FIRST! 2. READ the instruction if you have ANY questions. After a long consideration I finally got myself a 6 ½ WMF pressure cooker. I always wanted one but was intimidated by all the horror stories I heard from friends. 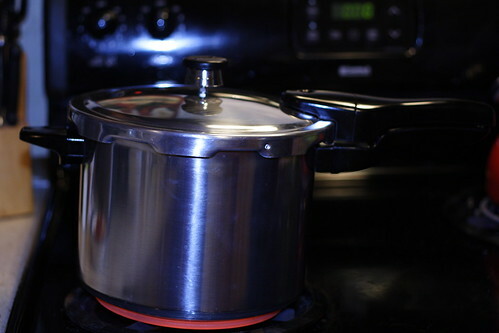 One of the wonderful qualities of the pot is that there is absolutely no guess work involved – I just watch for the pressure indicator to pop up and I know I have to lower the heat. Its stainless steel, dishwasher safe and with removable handle for easier cleaning. Last week I cooked 2 soups, a beef stew, beans with sausages and finally last night risotto with porcini and parmesan. I love love love my pressure cooker. I am looking forward to try your beef soup – maybe even tonight! This is really a coincidence! See, all the horror stories are the problem! I am sure there are a lot of people out there who don't know what they are missing. Yesterday I made sauerkraut with sun dried tomatoes, rice and buckwheat for 20 min and the sauerkraut was melting in your mouth. I'm telling you, this is my favorite cooking dish ever! How did you do the risotto by the way? Annie - here is the risotto recipe. I got it from the cook book "Pressure cooking for everyone" - you can find it at Amazon. From there I got several ideas to try. I see you have a Facebook page – see you there in a minute! 2. In the pressure cooker melt 2 tablespoons of the butter, add the onion and cook until softened – about 3 min. Stir the reserved mushrooms and the garlic – cook for 30 sec. Add the rice and stir constantly until the rice is well coated with butter but not browned – about 1 min. Add the wine and cook until it is evaporated – about 2 min. Add the water and broth. 3. Lock the lid in place. Bring to high pressure over high heat. Adjust the heat to maintain the pressure. Cook for 6 min. Remove from the heat and quick release the pressure. Taste the risotto – it should be barely tender (al dente). If necessary return to medium low heat, add ½ cup broth or water, and stir until the rise is tender. Stir in the Parmesan cheese, add Gorgonzola if desired. Stir in the remaining 2 tablespoons butter. Season with salt and pepper. Serve immediately. I have had my pressure cooker for 2 years now... it's the ONLY way I make risotto... total time at high pressure, is only 7 minutes! I make my chicken stock this way as well... only 30 minutes at high pressure and so full of flavor! Enjoy your new pressure cooker! PatsyK, I am in awe from your blog! Great job!!! Krasimira, I absolutely loved your story! :-) I am so glad I found other people who share my excitement about the pressure cooker! You are right, who indeed wouldn't agree to spend less time in the kitchen and have healthy and delicious food every time?! About the recipe...I didn't take pictures and I would hate to post a recipe without pictures. Do you prefer to wait until I take some and post in on the blog or you want just the recipe? If it's the second one I can give it to you sooner than the other one, since I'm swamped with things I have to finish by the end of January. Let me know, I would gladly give you the recipe! Krasimira, I would love to have your pictures too! I'll post the recipe later! I want to buy a pressure cooker. Can anyone suggest best brand? Well, it depends on the size and material you a re looking for. This is one brand, but there are others out there that are good too.